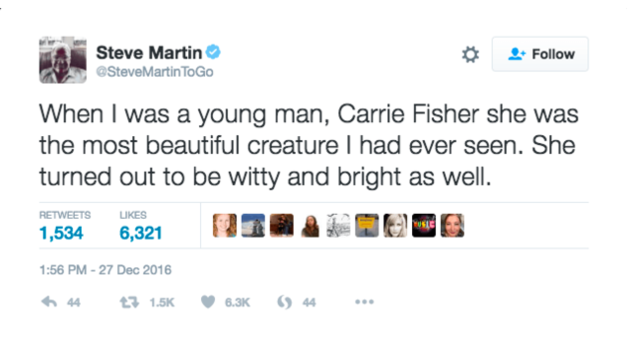 Comedian and actor Steve Martin deleted a tweet he posted about his friend Carrie Fisher after other Twitter users labeled it "sexist." Martin's tweet was meant to honor Fisher, who died Tuesday afternoon at the age of 60 a few days after she had a heart attack on a flight from London to Los Angeles. New York Magazine posted a response to Martin, comparing him to "Star Wars" villain Jabba the Hut, who kept Fisher's character, Princess Leia, prisoner as she wore a gold, bikini-like costume. Other Twitter users called Martin a "jerk", among other names for his sentiment. Martin eventually deleted the tweet, even though others came to his defense.
. @NYMag Really? @carrieffisher WAS beautiful. In every way. @SteveMartinToGo knew her & cared for her - how dare you objectify HIS grief?? Martin wasn't the only one to get called out for a Twitter tribute to Fisher. 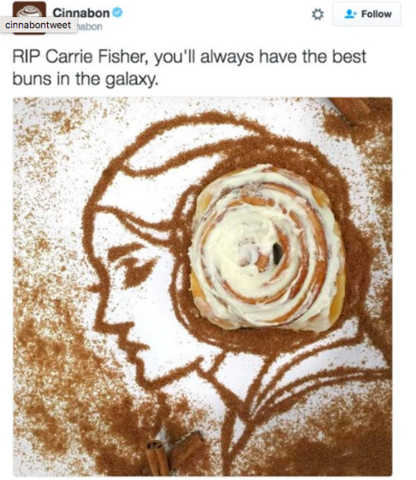 Cinnabon, the company that sells gigantic cinnamon rolls, joined in the public grief by posting a tweet in commemoration of Fisher and her iconic hairstyle from "Star Wars: Episode IV — A New Hope." In the post, someone created a picture of Princess Leia using cinnamon and replacing her notorious hair buns with its trademark pastry. Unfortunately, what Cinnabon may have thought was a sweet and funny tribute angered many fans of the actress. @SydneyTom_ @Cinnabon Carrie Fisher isn't even buried yet. It's no time for jokes and sales pitches. Not buying Cinnabon is MY response. Cinnabon deleted the tweet and posted an apology not long after the fans caused a disturbance in the social media force. Our deleted tweet was genuinely meant as a tribute, but we shouldn't have posted it. We are truly sorry. While many fans expressed their disgust for the original tweets, other people believed Fisher, who was well-known for her wit, would have enjoyed the tribute. "I weighed about 105 pounds at the time," she said. "But I carried about 50 of those pounds in my face. So you know what a good idea would be...? Give me a hairstyle that further widens my already wide face!"